There's no shortage of sad dudes with guitars, but not all of them can dig into that sweet spot between country and the blues like Brian Pounds. The Austin singer-songwriter has been pounding the pavement (see what I did there?) for a while now. He's achieved some attention via a season 5 stint on the Voice, but don't let that dissuade you. The guy's a great singer, and he's also a songwriter with depth. Pounds seems most in his element when writing about love -- especially love gone afoul. The soulful "Odessa" pretty much describes my entire dating history, so it hits a homerun for me. 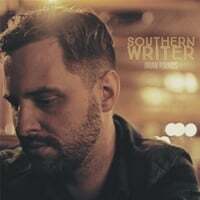 Most of the songs on Southern Writer are in that vein: acoustic-based songs about heartache and loss gussied up with a powerful string section. This is the kind of album that works best either when you're nursing a breakup or entering something new; it reminds us of the contingencies of these kinds of things, but could be a lot if it's still fresh -- because Pounds really goes there.